When I first heard that Louie invited John and Edward to be part of the live shows, I was perplexed as they clearly cannot sing, and their choreography timing is atrocious – they’re more dyspraxic than I am! But then I remembered what I was told by someone who worked in television when Same Difference were in a similar position as John and Edward today. The only aim of the show is to make money. Advertising revenue only goes so far and the money to be made from the act who actually wins cannot be determined beforehand. But the phone lines are what shows like this are all about. What better way to explode the number of phone calls the show will get from the public, than to throw in an untalented act to cause anger and controversy among the public? 1. For a start, not only can they not sing in tune, but they have very little strength in their voices (which if they cannot sing in tune, is a great blessing). 2. They were also twin brothers, which is seen as both cutesy and annoyingly sad and embarrassing, depending on your views. 3. They are young and naive, and don’t know they are untalented – perfect! The show can take the piss as much as they like, and the boys won’t even know! 4. They are also good looking enough to ensure thousands of teenage girls will be running up mum and dad’s phone bills. So Simon Cowell and Louie Walsh agree beforehand that if such an act comes along, “grab em quick so we can clean up!” They must have thought it was Christmas when John and Edward came along and ticked all the boxes. So with the twins’ only talent for frightening and angering people, the stage is set. Because there are so many more talented people in the competition, the family and supporters of the acts that really do have talent are incensed more and more each week that the boys stay in the competition. And they do everything in their power to get as many people to vote for their loved ones and try to give the twins the boot. Several exceptionally talented acts have already been victims of this cruel TV practice including the brilliant Rachel Adedeji. But as they went out due to not enough public votes, it’s not a case of a potential winner losing out to this practice – unless they actually win! The thing that confirmed this theory for me was last week when it was Big Band week. Louie could so easily have given the boys a classic big band song and got the lads to dress up smart and just stand and sing, but no. The boys are now a circus act, so the more vomit inducing colorful dancers there are, the better. The more dancing the twins have to do the better – they’ll be even more out of breath and the poor singing will be even worse. Also the less serious the song the better. ‘She Bangs’ by Ricky Martin was the perfect song to maximize ridicule for the Grimes brothers. I actually wonder if the female judges are even in on this conspiracy. Dannii shakes her head in despair before remembering to continue the diplomatic charade. 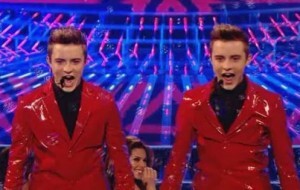 Cheryl in particular seems to genuinely believe that Louie is in love with Jedward as they are now known. Then again, Simon will probably have instructed the judges all to act their socks off when commenting on John and Edward’s performances. But comments like “Out of all the acts, yours is the one I most look forward to” tells me Cheryl’s no actress. I doubt the Grimes can win, but what do I know? Is it possible that the Sacrificial Lambs could sacrifice the integrity of The X Factor itself and actually win? It would be horrific, but kind of a strange karma for the show to have its plan backfire. For Punk-sweater-wearing black sheep and people who were born to create. Andrew Scott: Ant and Dec’s Lovechild? - they've never been in the box.